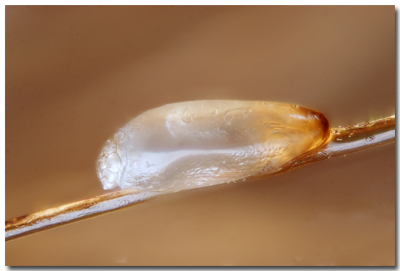 Head lice lay eggs (called nits) by gluing them to the hair shafts near the scalp. These are six legged parasites that spend their entire life on the human head. Since they exist only to mate, feed and lay eggs their nits are adapted well for survival. Nits are cemented to the base of the hair shaft so the heat from the scalp will offer the warmth they need to incubate and hatch. This is much like why a chicken sits on her eggs. When the nit hatches it is also convenient that it is very near the scalp to have it’s first meal…they live on human blood for their entire nourishment. Nits take 7-10 days to hatch. The nit itself will grow in size as it matures until it hatches. Once hatched the baby louse is called a Nymph and its looks will not ever change through it’s life cycle…only it’s size. Nymphs mature into adults about 9-12 days after hatching from the nit. Lice do not jump or fly! Lice do not have wings so they simply cannot fly…and although their legs are beautifully designed for moving around a head full of hair they cannot jump. Head lice cannot live on our pets! This is a human head louse and it only lives above our neck on a human being. On occasion head lice may be found in eye lashes and beards but no where else on the human body. A fertile female head louse can lay up to five eggs (nits) at a time and she lays two times per day. Over the course of her 30 day life span that means she can lay up to 300 nits Imagine how quickly a head lice infestation grows when there are a few females doing their work simultaneously! Now add fact #2 above to this situation and think again about how fast this population grows on an infested head! Evidence of head lice does not indicate dirty or un-kept personal hygiene-lice actually prefer clean hair to dirty hair. Lice claws work best on clean hair because they can grab and go without slipping on a more oily hair shaft. Head lice feed off our scalp blood and cannot survive off the human head for more than 24 hours. This is some of the only good news about head lice. Because of this fact the cleaning of your home, car and the rest of your environment is not as critical as we may have been led to believe. 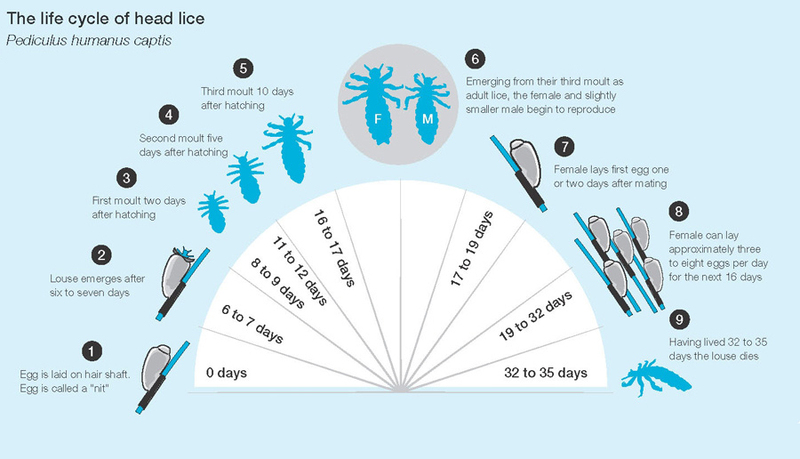 If you consider where the infested head has been in the last day, and then treat those areas, you can feel confident you will not spread lice from your surrounding environment.